While I was looking for adopters of the three lovely puppies that I accidentally found, most people simply replied “We love dogs but we cannot take one home.” One lady referred me to someone who might be able to help me find a potential forever home. I contacted her, hoping she might adopt the three puppies or help me find somebody. 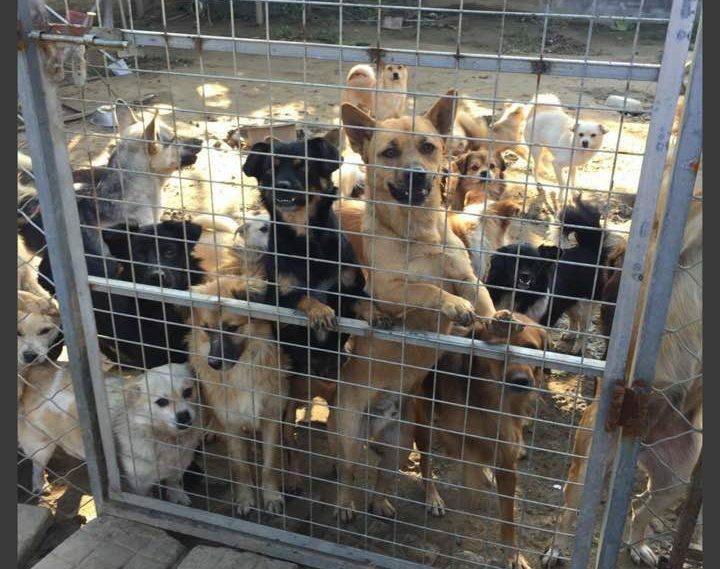 Upon contacting the potential adopter, she told me that, “I have more than 120 dogs, what about I give you a few?” Immediately I wondered “How can one person have more than 120 dogs?” ! 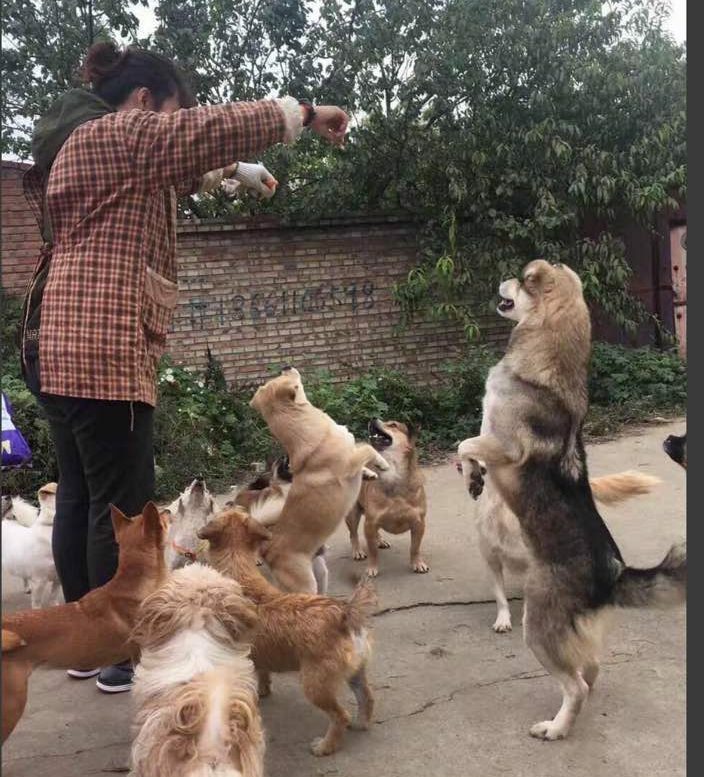 I know a lot of people in Beijing helping more than one dog, buying food for them with their own limited salary and taking care of their medical or health needs. 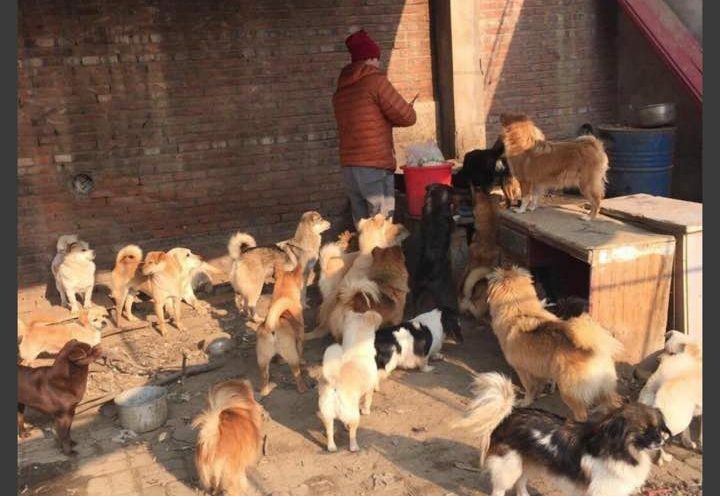 Owning 120 dogs in any capacity though seemed completely impossible. I interviewed the young lady to find out how she managed such a task. 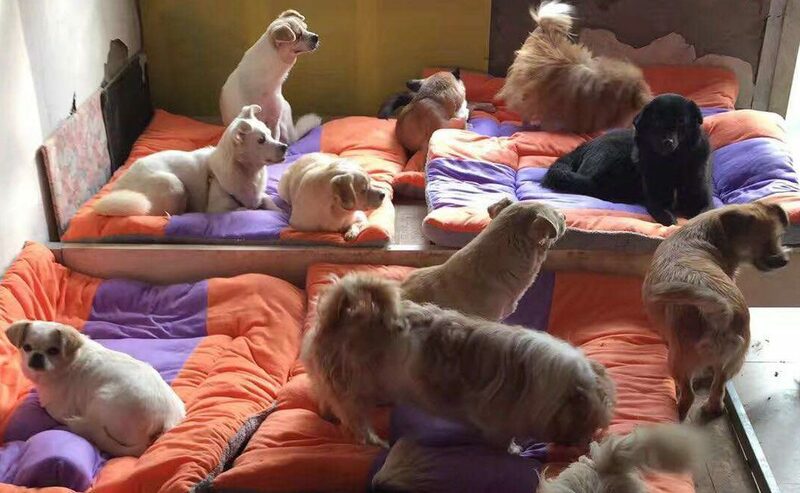 She has a day time job in finance and takes care of all these dogs in the evening after work. 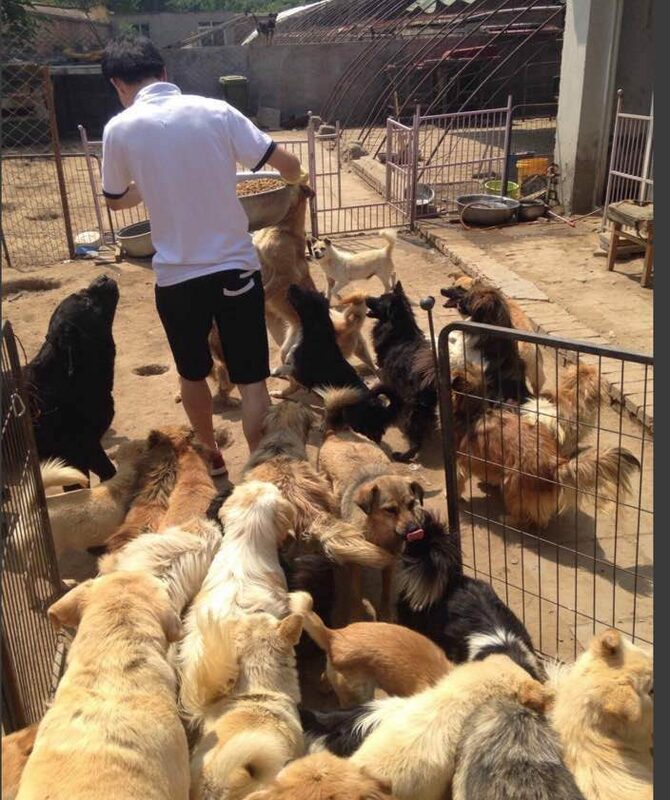 Her boyfriend helps her a lot with the daily running of the dog’s shelter. She prefers to be called April. 1. How did this start and when did you get the first stray dog? It was a white female dog I found during the day in my neighborhood. She looked helpless and remained there until the evening. Since at the time I had my own pet dog, I instantly sympathized with and cared about this new dog. The security guard said that she was abandoned by her owner who lived in the basement. The owner had another dog which they sold since it was considered to be a better breed. This one was a common one so dumped in the neighborhood. So I left her at my friend’s pet center and later at my nearest dogs shelter. 2. During the many years of taking care of dogs, did you ever have struggles or concerns? Sure. My income is very limited. How can I feed them and take care of them? These questions always bothered me. However, I didn’t have too many struggles. When see those life-seeking and helpless eyes, see the desperation of dogs to be sold by owners to become food, you wouldn’t struggle too much. You only think about ways to rescue them, how to feed them, and how to find a trustworthy owner for them. 3. How did the number of dogs increase from 1 to more than 120? The number of dogs increased very quickly. 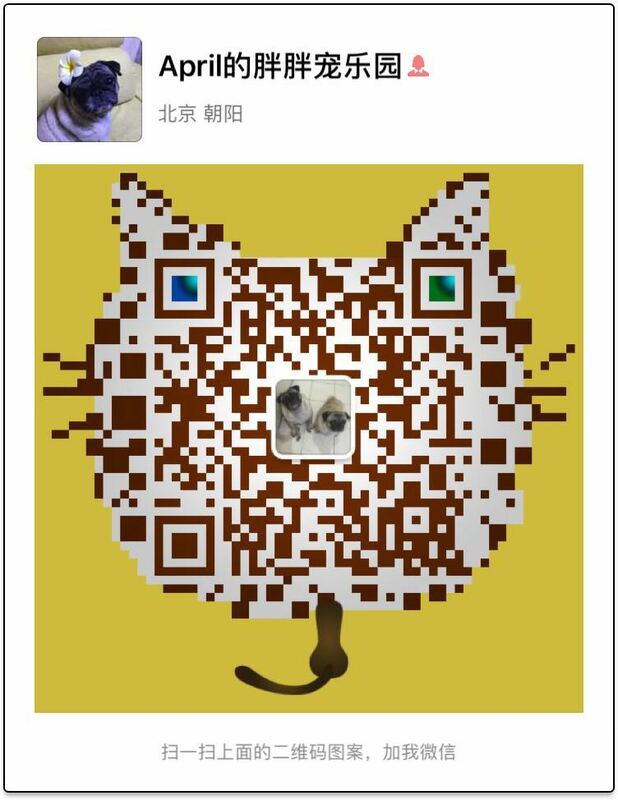 In China, there exists a minimal awareness of proper pet culture and animal welfare. Abuse is often not a crime but simply done for fun. The cost of moral reproach or crime against animals is very low. Abusing, ill-purposed reproduction, stealing, and illegal dog meat are all what we fight against. Many stray dogs are extremely sick while some are deserted on purpose. These dogs are the ones we aim to help. I hope to use my strength to win kinder treatment for a greater number of animals. Over time, more and more dogs came to my place. My limit has been constantly extended. 4. What’s your daily life like? As I have to go to work day time, I care for the dogs and cats after work. For example, visiting families who will potentially adopt, taking the dogs to get vaccinated, and checking on animals who have been hospitalized for treatment. During the weekend time I usually clean up the shelter, trim the dogs’ nails and brush their hair, etc. Sometimes we get volunteers come to improve the shelter’s conditions. Since there are too many dogs, facilities are often quickly damaged, needing constant repair or replacement. Winter mats need to be sunned every week or replaced. There are no rest days. Being together with them and seeing their smiling faces are my most cherished rewards. 5. What are the challenges? Too many challenges! Money is not the first thing. It is people. Very few people can do this for a long time. Some came with dogs they rescued, but then left the dogs here with me. A lack of human resources is the greatest issue. I need to work in order to cover all the expenses, but because I am constantly working I cannot set up a full-time staff to work on adoption, visitation, cleaning up, publicity and management. I am the one doing all the work right now. We need people to be willing to sacrifice their time and resources. The next challenge is funding. Every new dog brings with it a new host of financial responsibilities. These financial impacts include annual vaccinations, medicine, treatment, and utilities. The third challenge is social recognition. Many people consider it a waste of money and time to care for these dogs. They think participating in other charities would be much more worthwhile. I don’t want to lecture here, but just think, if I can save a life just by reaching out my hands, how could it be a wasting of time? If one cannot extend kindness to a reachable life, how could it be possible to do greater charity? Kindness does not differentiate between size or species! 6. Did you ever think about giving up? Yes, I did think about what their lives would be like without me. It was only a thought, nonetheless. I cannot give it up. When you see their lives changed because of you, from being afraid of human beings to wanting to be close to human beings, and from being paper-thin to being big and heavy, you could not possibly give it up. Such achievement and satisfaction cannot be reached by buying a LV bag. I will not give up. Surely one day I will be too tired to do it, but I will first find ways for them to be well taken care of. 7. 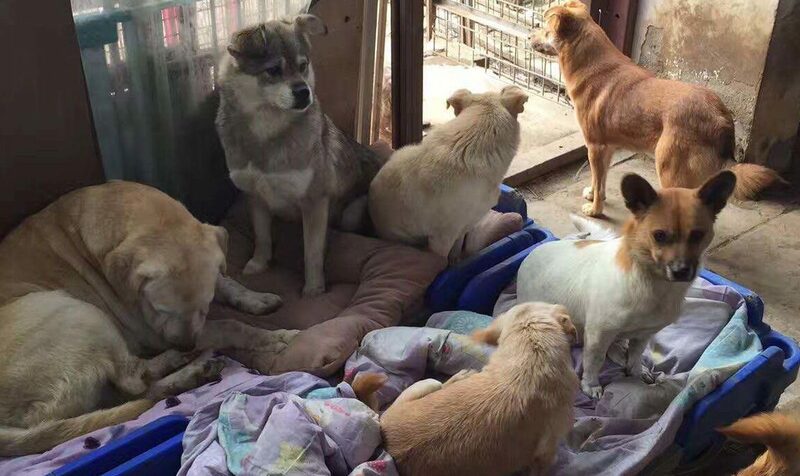 What new perspectives have you obtained while helping all these dogs? Dogs are animals with great feelings. Once a dog was hit by a car on an express way, lying there covered in its own blood. There was another dog as well that never left the afflicted dog’s side. Eventually both of them were saved and lived at my shelter. They ate together and always stayed together. Unfortunately one of them died due to sickness this year after having lived here for four years. The other dog then never left their den, nearly always lying there. Seeing this I realized that the feelings of these dogs are sometimes on par with or even greater than that of human beings. They know everything that is happening but simply cannot express themselves with words! 8. What kind of help would you need?